Melissa Aronczyk and Devon Powers, eds. Blowing Up the Brand: Critical Perspectives on Promotional Culture. Peter Lang, 2010. 339 pp. 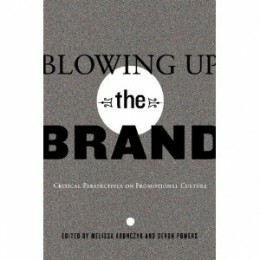 Blowing Up the Brand, an edited collection originating from a conference of the same name held in New York in 2009, does not so much seek to provide definitions for the brand as it does critically engage with “the increasingly central role of brands in contemporary culture” (5). Extending the line of critique introduced by Andrew Wernick’s seminal book, Promotional Culture, which describes “an environment in which capitalist forms of exchange came to dominate all other forms of exchange” (4), Blowing Up the Brand takes as its starting point the fact that branding has become a practice ubiquitous among supposedly non-commercial entities, such as educational institutions, political actors and medical devices, in addition to corporations that wish to promote their products and services. By the end of the volume, the reader is left with a great deal more insight into how this is so in current times. The collection of studies included spans many dimensions of the debate about how branding has come to shape and influence many dimensions of contemporary politics, culture and society. The double meaning of the phrase “blowing up” provides insight into the juxtaposition of work included in the volume. One the one hand, it can entail the deconstruction or exploding of an idea and set of practices associated with brands, which have become incredibly influential in communication and management practices in the creative and cultural industries and beyond. To blow up the brand in this sense is to push against the normative notions of promotional culture and commercial communication that have arguably seeped into almost every form of public image management in the contemporary age and to develop critiques of its power. On the other hand, “blowing up” can indicate magnification. From this perspective, the analytical lens is tuned less to pulling apart and challenging normative brand practices, and more to an exercise of better understanding how brands are constructed and operate, that is “perceiving the intricacies” (18) of the brand. Drawing on Lazarsfeld’s (1941) characterization of two streams of media and communications research, these two meanings of ‘blowing up the brand’ can be aligned more broadly with what might be termed the ‘critical’ and ‘administrative’ approaches to studying brands. The former is aligned with social sciences and humanities approaches to studying culture, and is rooted in deeper concerns about power, identity and agency. The latter is rooted in management and marketing studies, which aim to contribute to the efficient practices and strategies of organizations that practice branding and institutions that own, or wish to construct, valuable brands. Despite the play on words and a claim that the aim of the book is to “neither lament nor cheer the branded world” (21), Blowing Up the Brand speaks more to the critical than the management tradition, as indicated by its subtitle, Critical Perspectives on Promotional Culture. This is not to suggest that brand practitioners are unlikely to find value and relevance in some of the chapters included, but rather to highlight the fact that the critical agenda provides a red thread that pulls the volume together. This is neither one-dimensional nor rigidly compliant to overly deterministic Marxist models of how culture is produced and shaped by political-economy. It takes into account that in order to critique promotional culture in all its forms, it is also necessary to understand its operations, and this requires insight into the practices of branding practitioners, as well as the values that they hold. Thirteen chapters penned by a cross-section of scholars, both established and emerging, each present new empirical work that ‘blows up the brand’ in a different way; each provides an account of one of the many ways in which promotional culture saturates, and is constantly rearticulated throughout, the flows, practices and spaces of everyday life. These are prefaced by an introduction by editors Melissa Aronczyk and Devon Powers, who outline three key conceptual orientation points. The first, drawing on the work of Adam Arvidsson (2006) and Celia Lury (2004), reiterates that branding is a form of communication that ‘does work’ (i.e., creates value). The second highlights the conceptual place of the public (as an agonal space) in theorizing the brand (as performative). The third, again drawing on the work of Lury, emphasizes that the brand is a site of (inter)activity, an interface between production and consumption, and as such, one that demands new forms of media literacy. Although there are many links and relationships that can be drawn between the various chapters, for the purposes of this review, I will group the key contributions of the volume into four themes: those that engage with the role that branding plays in forging new forms of social relations, those that problematize questions of power implicit within branding practices, those that critically asses the intersection of branding with individualized subject positions, and those that seek to provide an account of how promotional communication produces affect. Social relationships play out in public spaces, through public debate about matters of social justice and in exchanges related to the provision and receipt of socio-economic facilities such as education and health care. Engaging with the extent to which promotional culture has shaped consumption practices in public shopping spaces, Arlene Davila reports on an ethnography of a Puerto Rican mall. She argues that credit-fuelled consumption as well as performed sociality in the spaces of the mall allow “Puerto Ricans to protect and project an optimistic image of the island as a modern country with high living standards in reference to an imagined ‘third world’ beyond the island that truly suffers” (111). Graham Knight’s article explores how activist organizations and networks are forced to use the tools of promotional communication and branding in order to “acquire prominence in a public sphere crowded with noisy, competing actors” (190). This raises questions about the freedom and quality of public debate, now that branding has become a stabilizing factor and organizational identity reference point, even for social justice movements. Considering the broader question of whether education should be marketized, Alison Hearn writes about the ‘Promotional University 2.0’, reviewing the conflicted history of the university and the rise of the ‘corporate university’, which has intensified since the 1990s. Considering case studies of North American universities, “the degree to which image, reputation and branding play a central role in the generation of capital” is considered evidence of the increasing impact of neoliberal values in the education system. Health care, like education, might be considered an area of social life that should remain outside of the ambit of promotionalism. However, as Mary Ebeling demonstrates, “branding contributes to the wider commercialization of medicine” (242). The chapter explores how this happens by focusing on the development of a marketing campaign for a medical device intended to be used off-label for cosmetic purposes in the US. Ebeling concludes that the “direct-consumer marketing of branded medical devices that emphasize consumer choice over medical expertise” aims to “insinuate the brand into the centre of the relationship between a patient and a doctor” (248) – an area that has significant, even life-threatening, implications for health care and the rights associated therewith. Brands are enmeshed in structures of economic and political power. Liz Moor and Celia Lury, adding to their already seminal individual and joint contributions to critical theories of the brand, outline the “social and technical means through which brands are implicated in the measurement and creation of value” (30). In other words, they discuss the ways in which brands are defined as assets and therefore embody economic power. Considering the central role that ‘value’—at first material and increasingly informational—plays in the organization of neoliberal societies, this is a crucial area for ongoing research. In their chapter, Moor and Lury outline forms of economic value beyond the financial and analyze corporate brand valuation strategies in order to highlight “their multidimensionality, lack of internal consistency and reference to external measurement standards, and relation to a dynamic space of future possibility” (48). They emphasize that brands are ‘epistemic objects’ precisely due to the ways in which practitioners are able to experiment with definitions and constructions of value. Considering the explicitly political dimensions of communication, John Corner’s chapter provides an account of the ways in which deception has become “professionalized” in political communication, as well as an outline of the key features of “institutionalized deception.” Corner considers the challenges that this poses for critique in its engagement with the ethical and normative dimensions of the role that communication (particularly the carefully managed form of spin common to political communication professionals) plays in democratic societies. Two other chapters provide explications of seminal case studies of the intersection of branding and political power. Gabriele Cosentino and Waddick Doyle take a close look at the career of Sylvio Bersluconi, Italian prime minister and corporate brand, who rose to power precisely due to his canny ability to apply market logic to his rhetoric, as well as strategies of commercial communication to his image management. Cosentino and Doyle argue that “Berlusconi’s main political innovation [is] his capacity to generate and maintain public attention with an innovative use of language, the strategic use of visibility, and the capacity to move across multiple social domains” (225), that is, the ability to function like a brand. Across the Atlantic, Miriam Greenberg examines the relationship between political-economic brands—as embodied in the New York City mayor Michael Bloomberg—and city brands, in particular the revamped city branding campaign for New York City ushered in by the Bloomberg administration. Greenberg shows how the Bloomberg brand was established by his formidable corporate and media experience, which in turn defined his election campaign. This co-evolved alongside the development of a new NYC brand that in turn contributed value to the political identity of its champion. Greenberg concludes that the “utopian urban imaginary” represented in the new NYC brand is “reinforced by the rebranded image of urban politicians” (139). Commercial communication in general, and branding in particular, aims to encourage the construction of personal relationships between consumers and the object of their consumption. Subjectivity and identity are thus key arenas of critical concern. Jefferson Pooley’s contribution aims to resurrect an area of scholarship that, although apparently neglected, remains relevant to contemporary studies in promotional culture: “thinking on the twentieth century consuming self,” which highlights the “yearning for individual self-fulfillment through authentic experience.” This cuts to the heart of the role of subjectivity and the ways in which consumer culture invites us to perform the self through brand attachments. Pooley argues that a contradiction central to contemporary brand culture, namely “the injunction to explore and realize one’s true self is hopelessly mixed up with the demand to treat oneself as an object” (78). Hongmei Li provides a fascinating account of the ways in which discourses of self-worth and reputation in China shifted from a class-status framework in the decades following the founding of the People’s Republic of China, to a commercially oriented, individualized framework since the 1990s. This move from chengfen to shenjia highlights the particular ways in which marketized discourses have influenced the construction of identity in China, and raises questions about the unique characteristics of this process in other non-Western contexts. Shifting to questions of the subjectivity of producers of brands, Sarah Banet-Weiser and Marita Sturken analyze artist Shepard Fairey’s “creation of a recognizable ‘nonbrand’” and his own status as “an icon of a new form of cultural entrepreneurship whose profile reveals the current relationship of brand culture, postmodern indie remix culture, and neoliberalism” (265). They argue that Shepard Fairey’s model of anti-consumerist cultural entrepreneurship complicates the binary model of consumerism vs. social activism and has created a new meaning of the brand. Jonathan Gray examines several case studies in order to argue that paratexts such as promotional texts for television shows and films can function as productive sites of meaning that supplement the artistic narrative in the primary texts. From this perspective it is possible to appreciate the ‘culture’ (textual production) that goes into certain forms of promotion and how intertextual brands are produced and operate in very effective ways in the marketplace. In an important contribution to the study of brands and their relationship to questions of affect, Devon Powers raises questions about the branded soundscape. By focusing on the emotional resonance produced by music, and the significance of music to branding practice, Powers argues that “music is endowed with the power to brand” (287). By reviewing the strategy documents of sonic branding practitioners, Powers makes the case that “the sound of a brand is not simply an addendum to its visuality but is rather a multifaceted terrain of value worthy of consideration on its own terms” (289). How multimodal communication can produce multisensory affect is something as yet understudied in critical literature on branding and is certainly deserving of more attention. Ultimately, what Blowing Up the Brand succeeds in doing is “draw[ing] examples from a variety of sites to magnify the ways in which brands have become structuring elements of our everyday lives”(3). It is worth noting that the case studies in the book, barring two chapters, are limited to Western contexts, and there is huge scope for more research that explores questions of social relations, political-economy, subjectivity and affect in branding in other cultural and linguistic settings, particularly in the ‘global south’. The contemporary expansion of branding beyond commercial strategy and into social, individual, political and cultural spheres is convincingly demonstrated by significant empirical evidence presented in Blowing Up the Brand. However, an open theoretical question remains (appropriately) unanswered by the volume: to what extent does the conception of branding as a ‘silver bullet’—a ‘one size fits all’ promotional tool appropriated by a variety of social actors in order to achieve power—itself require scrutiny? What are the possibilities for the deconstruction and discursive dismembering of the concept of the brand itself, and what might be the implications of this project for empirical research about branding practices? Nevertheless, Blowing Up the Brand provides a rich and timely cross-section of current critical approaches to commercial communication and promotional culture, and as such, represents a valuable contribution to this evolving field of scholarship. Arvidsson, Adam. Brands: Meaning and Value in Media Culture. New York: Routledge, 2006. Print. Lazarsfeld, Paul F. “Remarks on Administrative and Critical Communications Research.” Studies in Philosophy & Social Science 9 (1941): 2-16. Print. Lury, Celia. Brands: The Logos of the Global Economy. London: Routledge, 2004. Print. Wernick, Andrew. Promotional Culture: Advertising, Ideology, and Symbolic Expression. London: Sage, 1991. Print. Mehita Iqani is Senior Lecturer in Media Studies at the University of the Witwatersrand (Wits), South Africa. Her PhD is in Media and Communications from the London School of Economics (2009), and prior to taking up the post in South Africa she was a post-doctoral Teaching Fellow in Culture, Media and Creative Industries at King’s College London. Her core research interest concerns the relationship between consumer culture and the media, in particular how the latter discursively construct the former. Her first book, Consumer Culture and the Media, is contracted with Palgrave-MacMillan and due for publication in 2012.